High on the list of things that I ‘hated’ to eat as a child -which was an extensive list because OHMYWORD I was picky!- were mushrooms. I can’t say I tried them with any frequency, but I mistrusted them. It’s quite possibly insane to have a lack of trust in a food, but there was something about the weird shape, texture, and earthy flavour that made me wonder whether they were entirely a good idea. Somewhere along the line, someone gateway drugged me into liking them by introducing me to deep fried mushrooms. Good golly. I fell hard and fast. Before I could say “fungi!” I was obsessed with eating mushrooms in every possible which way. 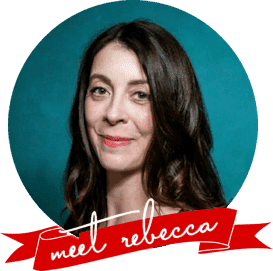 Rather than the obsession abating, it has grown and grown over the years. You could ALMOST say it was growing like mushrooms after the rain. I love mushrooms in almost all places where beef would normally be, and a slash and burn sale on baby bella mushrooms at my local grocery store a couple of weeks ago put me in possession of several pounds of the mycelium delights. With boxes and boxes of mushrooms upon my counter, I decided to tackle a project I’ve wanted to have for ages; Garlic Mushroom Stroganoff. 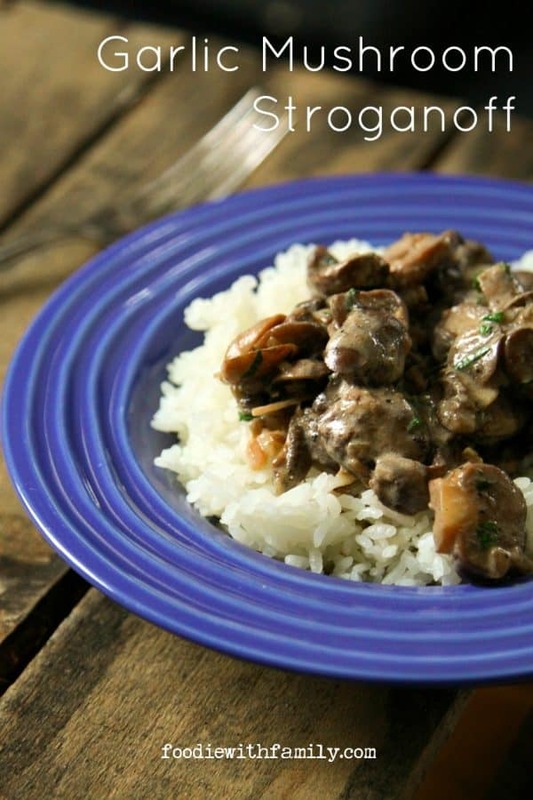 The goal was all the creamy, rich, intensity of beef stroganoff, but with mushrooms instead. It turned out to be a good thing indeed that I had procured nearly 10 pounds of the little beasties, because Garlic Mushroom Stroganoff ended up being a little tougher to dial in on than I thought. I started with a recipe I had found elsewhere on the omniscient interwebs from a well-respected food magazine. The result? Delicious and creamy mushroom soup. There was none of the clingy, creamy sauce that I wanted so desperately. A second attempt yielded slightly less soupy soup. Then I pitched their recipe and decided to make my own because, DUH, that’s my job. My husband, being a devoted mushroom lover, was perfectly happy to eat all of my iterations of Garlic Mushroom Stroganoff (from soup to end product). My final version ended up EXACTLY as I had envisioned and craved; a rich, intensely mushroomy, garlicky, and creamy sauce that enrobed the tender but meaty mushrooms. I served it over rice, but it would’ve been absolutely lovely over buttered homemade egg noodles, too! 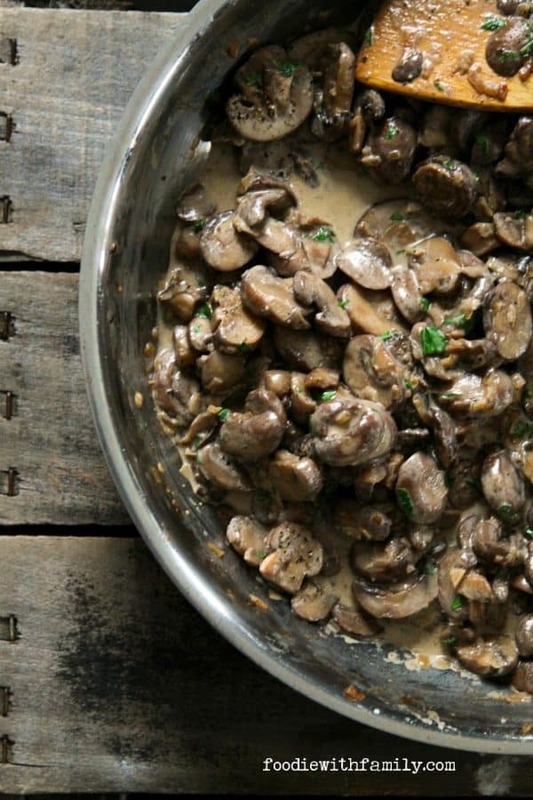 This is EVERYTHING for serious mushroom lovers, friends. Bonus: it’s done in under 30 minutes from start to finish! Use a shallot or small red onion. Either will work in this dish. A shallot will yield a slightly subtler onion flavour than the red onion, but both are tasty! As for the wine, choose one that is dry or semi-dry and good for sipping. I used a decent but not pricey Pinot Grigio. After adding the wine to the mushrooms, you’re going to raise the heat and boil off most of the liquid, reducing the mushroom juices and wine to an intense concentrate. Don’t skip this step or you’ll end up with creamy mushroom soup which is tasty, but not what we’re going for here. This recipe was tested with full fat sour cream. I honestly have no idea whether a low fat sour cream would work because I just plain don’t use it. For the love of all that is good and beautiful in the world, please use freshly grated nutmeg in this. PLEASE. I’mma begging you! You don’t need a fancy device, just a rasp grater and some fresh, whole nutmegs! The difference in flavour is astonishing. Trust me. Melt the butter in a 12-inch heavy-bottomed skillet over low heat. Add the diced shallot or onion and a pinch of salt. Saute the shallot or onion until translucent, about 3 minutes. Add the garlic and cook until fragrant, about 30 seconds. Add the mushrooms and salt and toss to coat, then raise the heat to medium high. When the mushrooms have started releasing their liquid and there are some standing juices in the pan, add the white wine and grated nutmeg and raise the heat to high. Cook the mixture, stirring frequently, until most of the liquid has evaporated, about 5 to 10 minutes. Remove from the heat and stir in the sour cream, parsley, and black pepper until the sauce is uniform and smooth. Serve hot over rice or buttered egg noodles. This post was originally published December 16th, 2014. I love beef strogranoff but I usually put the meat aside and eat all the mushrooms first. What a winner this dish is for me. We are a huge mushroom family – Rich would love this so much!! Can you come cook for us? I’ll make this if you make me Grandpa Leo’s latkes and creamy horseradish sauce! 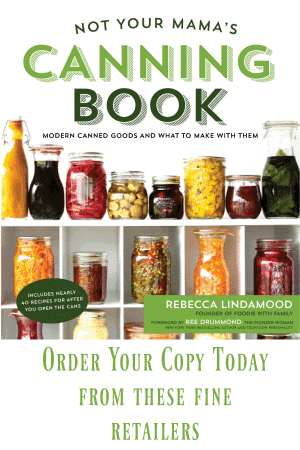 I think I may have tried that ‘food magazine’ version and was underwhelmed. Look forward to getting this on our plates very soon. 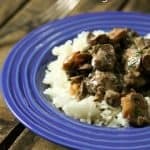 I absolutely LOVE stroganoff and this recipe looks incredible. Great job! 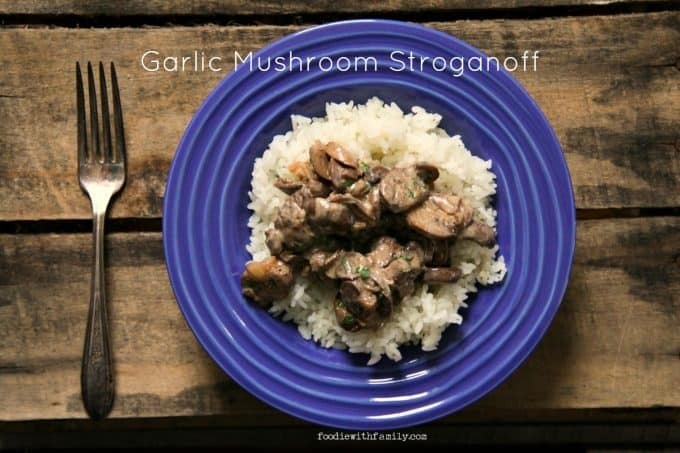 Stroganoff is one of my favorite childhood dishes, it’s so nostalgic and comforting to me. I happen to LOVE mushrooms, so I know would adore this. Oh my!! This stroganoff looks positively lovely! I will be SO making this dish…. I really love mushrooms. What a great vegetarian dish. I have only ever made stroganoff from a packet (I know!!) so am definitely giving this a try. My dad cans venison every year which is great. But sometimes I have a hard time coming up with recipes to use with it. This recipe is PERFECT. So I will be making GARLIC MUSHROOM STROGANOFF with venison for dinner tonight. THANKS! This looks fantastic! I need this in my life!!! HAHA! Nutmeg is a love it or hate it proposition, isn’t it? Mace is a lovely substitution! but not as intense in flavor. Made this for dinner tonight – wow it was excellent! There’s rarely white wine in the house here so I subbed in a nice merlot – delicious! Thanks for this great dish! That’s so good to know that it comes out great with red, too! We all enjoyed this tonight with a nice green salad. I did add bit of Annie’s vegan worchestershire sauce. Thank you again! You’re very welcome! I’m so glad you enjoyed it! I made this tonight & it was delish! I just want to point out one little oversight in the “Instructions” section…there is no instruction for the 2 tsps kosher salt. I had all of my ingredients measured & ready to prior to starting to prepare the meal. When we were cleaning up the kitchen we noticed the kosher salt hadn’t been used. So I went back thru the instructions to see where I missed that step & that’s where I found that there is no instruction for the kosher salt. So where do you use the kosher salt? Thank you for the heads up, Lisa, and the compliments! I fixed the instructions. The salt should be added along with the mushrooms to help them release their liquids! I am caterer and made this for a wedding rehearsal I catered and it was the HIT of the party – it was actually the vegetarian main and I couldn’t keep the NON vegetarians out of it! You’ve made my day, Caroline! I’m so glad it was universally loved! Hi Lesley- That depends on just how hungry you are. 🙂 I’d say at least 3 hungry adults would be satisfied by this, but if you have a more modest appetite, you could probably stretch it to feed 4 or 5.